In 2007, Puzzle Quest: Challenge of the Warlords combined gem-matching puzzles with RPG gameplay to create a unique and entertaining experience. Puzzle Quest Galactrix for the Nintendo DS attempts to replicate the experience… and fails entirely. Riddled with control problems, a sloppy port to the DS, and frustrating gameplay, Galactrix is a poor successor to Challenge of the Warlords. Unlike Challenge of the Warlords, which had a fantasy setting, Galactrix is a sci-fi adventure that takes place in the far future when humanity has ventured into space. Distant parts of the galaxy are now connected by a network of “LeapGates.” These gates allow nearly instantaneous movement from one star system to another. Other races inhabit the galaxy, but most have been conquered by humanity, which is is ruled by several mega corporations. The main character is a rookie pilot and players can choose to be either male or female, though the decision has no impact on the game. Players soon find themselves embroiled in a mystery when the LeapGates — all of them — suddenly fail and a group known as the Soulless begin leading players on an interstellar game of cat and mouse. The story itself is simple, and the cast is two-dimensional. It’s just enough to present a reason to go place to place and fight enemy ships. Paper beats rock! Take that, human! It is the Bejewelled-styled gameplay that is the heart of game. Galactrix takes new approach by using a hexagonal grid and crystals. Players must match three gems to clear them. Yet unlike standard puzzle games that have new gems falling from the top only, in Galactrix, gems can appear from any side of the grid, depending on which direction players move the gems in order to match them. This is an interesting twist that makes predicting gem movements trickier. Nearly everything in the game from battles to LeapGate hacking is done via a hexagonal grid, though the mini-games (haggling, crafting, mining, rumours) have slightly different conditions. For example, to investigate a rumour, players will need to avoid matching special gems for a set number of turns. These mini-games provide some pleasant variety and make good use of the hexagonal grid. The main gameplay consists of battles and LeapGate hacking. When a player’s ship engages an enemy vessel, a battle ensues. In battles, there are six colours of gem to keep track of, with each filling up a different gauge. Mines will also drop along with the gems, and matching these will damage the enemy. Matching up blue gems will allow players to restore their shield gauge. When it’s empty, enemy attacks will damage the hull and when the hull gauge reaches zero, the ship is defeated. White gems will add to the player’s Intel, i.e. experience. Purple gems will add psi points, which can be used to escape non-quest-related battles, provided one completes the necessary subquest. The other gauges — red, yellow, and green — are used for special abilities during battle. Unlike Challenge of the Warlords, abilities are not tied to class or level, but to the equipment players purchased and equipped on the ship. Even the ship itself can be replaced to allow for one with a larger shield gauge or more equipment slots. This system is a mixed blessing. On the one hand, having the right abilities can make most battles a cakewalk, but the reverse is true as well. Having poor equipment can make the game painfully challenging, and levelling in the standard RPG fashion is difficult and not necessarily helpful. Levels allow players to assign points to their green, yellow, red or blue gauges, increasing the gauges’ capacity and the number of points by which they increase when players match gems. Abilities, however, have a far greater influence on the flow of battle. Levels thus become secondary to equipment. By and large, though, battles are fun and provide an interesting new version of gem-matching action, with players continually balancing attack and defence. It seems like battles should be the heart of Galactrix. Sadly, that is not really the case as battle often takes a backseat to LeapGate hacking. Whoever said that getting there is half the fun would change his mind if he ever played Galactrix. The Galactrix universe consists of dozens of star systems on a gridwork of LeapGates. The star systems are represented as a hub on the overhead map. Players enter a star system by tapping on the hub. Once there, they will find a variety of planets, asteroids, and star bases where they can shop, play mini-games, and take on storyline quests or subquests that will yield money or experience. Both the storyline quests and the subquests require a great deal of travel from system to system. But — and this is a big ‘but’ — systems are separated by LeapGates, and since the LeapGates aren’t functioning, they will need to be hacked via a mini-game. To be clear, there are dozens upon dozens of LeapGates and players may need to hack through numerous LeapGates in order to complete a single quest. This might be all right were the hacking something like the well-designed battle system. Unfortunately, that’s not case. 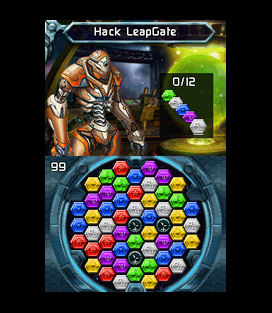 LeapGate hacking uses the same grid system as the battles but consists of timed rounds in which players must make a set number of gem matched in a radonmly generated order (e.g. green, purple, white, purple, blue, etc.). Gems shaped like clock faces can be matched to give a small boost to the timer. The problem is that because the required gem matches are random, as are the new gems which are added to the board, a great deal is left to chance. If the gems players need for the next match aren’t on the grid, they will have to make random matches until the appropriate colours show up — by which point there may not be enough time to reach the required quota. The result is that many attempts are necessary to hack some gates, particularly as the main story advances. Gates have three difficulty levels: easy, medium, and difficult. Easy might require twelve matches in ninety seconds; difficult might require twenty-four matches in one hundred seconds. While a certain amount of skill is necessary, LeapGate hacking is mostly a matter of luck, especially for medium and difficult gates. For players to successfully hack the most difficult gates, nearly everything must go right. Needless to say this can be very frustrating, infuriating even, when one is forced to attempt to hack the same gate over and over. This problem is not so apparent in the early stages of the game where smaller distances need to be crossed and the gates are all easily hacked, but those who persevere through the main quest and try to complete sidequests will soon find themselves spending more time LeapGate hacking than fighting ships — more by far. To add insult to injury, a previously-hacked gate can suddenly cease to function, forcing players to hack it again. Go left. No! Your other left! Getting from place to place — which seems to be the main thrust of the game — is further hampered by poor controls and load times. Yes! Load times — on a cartridge-based game! 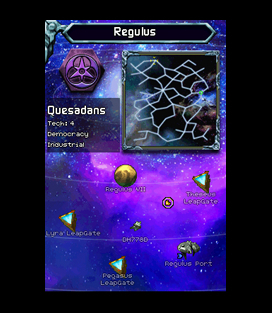 As explained, players spend a great deal of time in Galactrix moving from the map screen to star systems. Each time players go to a new area or to their menu, they will face a loading screen. Load times are increased by frequent auto-saves by the game, which allows no manual saving; indeed it requires none as it saves after nearly ever action. Every time players access their menu, fight a battle, enter a new star system, etc., the game auto-saves. The combination of load times and auto-saving makes the game frustratingly slow. The touch screen controls are also very problematic. The game is played entirely with the touch screen. Unfortunately, the touch-screen recognition is quite poor. Menu options will often need to be tapped two or three times before the touch registers. The controls in the star systems are worse. When players enter a star system, they will see their ship on screen and have the option of moving it to the planets and star bases in that system. It’s not uncommon for one to click on a location and have the ship wander off to a random point beyond it. What’s worse is that when one clicks on an option such as “Hack LeapGate,” the tap will not register and the ship will go wandering around the screen forcing players to try the whole thing over again. This is especially irritating when in enemy systems where hostile ships are about to attack, thus leading to unwanted random battles that yield experience only if players match white gems during the fight. The sloppy controls and the load times on their own might not be game-breaking, but combined with other problems, they exacerbate the situation and make the game even more frustrating to play through. Visually, the developers have done a good job with Galactrix. There’s no opening or ending movie, animated cut scenes, or anything very flashy, but what there is is pleasant to look at. Backgrounds and character portraits are colourful and well done. The grid is very clear and well layed out, which is essential in this type of game. Similarly, the soundtrack is limited, but good. There aren’t a huge number of tracks, but they are solid and the music associated with the Soulless is pleasantly creepy. Difficulty is extremely uneven, varying based on equipment in battles, and plain old luck when hacking LeapGates. Due to this, the playtime can vary tremendously, but it should be somewhere between twenty-five and forty hours, though completionists might add more time if they completed all the subquests. 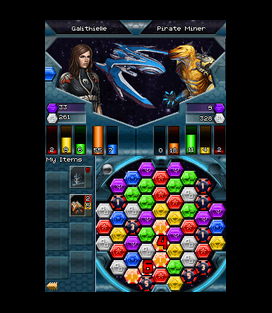 Gamers who are hoping for something they can pick up and play for ten to fifteen minutes may find some amusement in Puzzle Quest Galactrix; however, for those who want a game they can spend a few hours with, Galactrix has very little to recommend it. The game suffers from poor design, sloppy controls, and tear-your-hair-out, frustrating gameplay.